Update: Read about my experience at the American Express Hawks Island. If Amex Centurion Lounge and Centurion Studio weren’t cool enough places to grab a snack and drink, now you can enjoy a floating Amex Island! 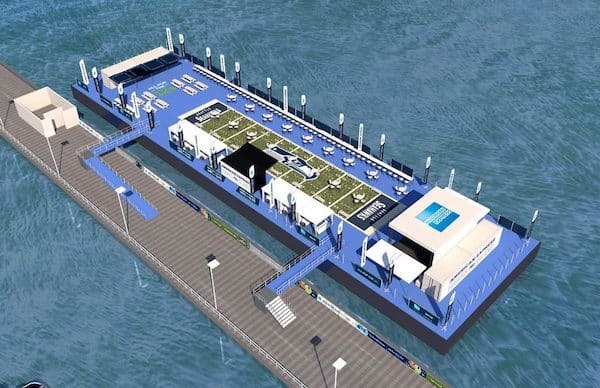 The American Express Hawks Island is coming to the Seattle waterfront on October 18 before the Seattle Seahawks vs Carolina Panthers game. Shawn Alexander (former Seahawks and Madden NFL Coverboy) will be on hand as well as a surprise musical performance… I’m keeping my fingers crossed for Macklemore! 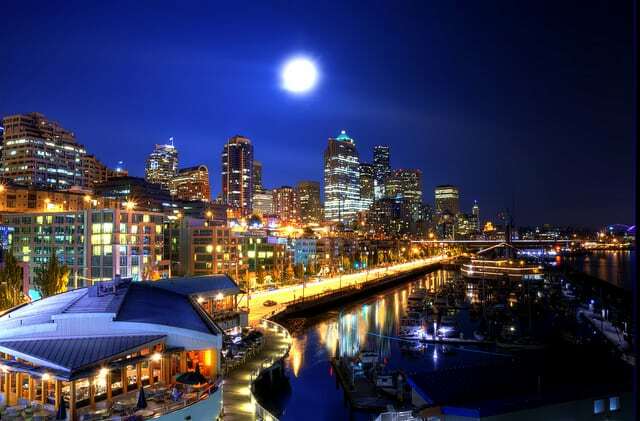 I always thought that a Seahawks Island would be a nice place to visit; even if there is no such thing as a sea hawk! Anyone with an American Express card (no requirement for what level of Amex, just any old Amex will work) can call 1-800-445-7374. I did so today and was able to reserve a spot for me and a guest at no charge. The agent said I would be receiving a letter/invitation in the next few days. Update: According to the website, the event is now SOLD OUT. My understanding is that the barge will be parked for Pier 66. This is a bit of a trip from the Century Link, but it sounds like they are offering free shuttles to the stadium before the game. 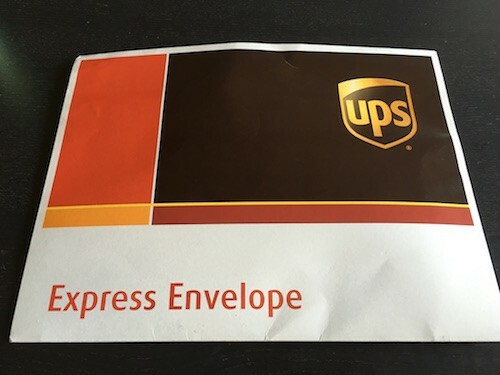 Update 2: Today I received a UPS envelope delivered to my home. It seemed a bit overkill, some of my Amex credit cards haven’t come via UPS. Inside was an envelope. 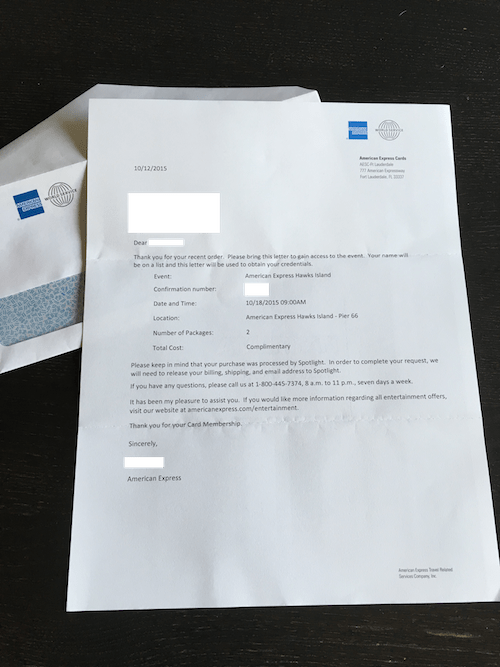 And inside that, a one page letter with confirmation number for the American Express Hawks Island. Photo of the letter below. 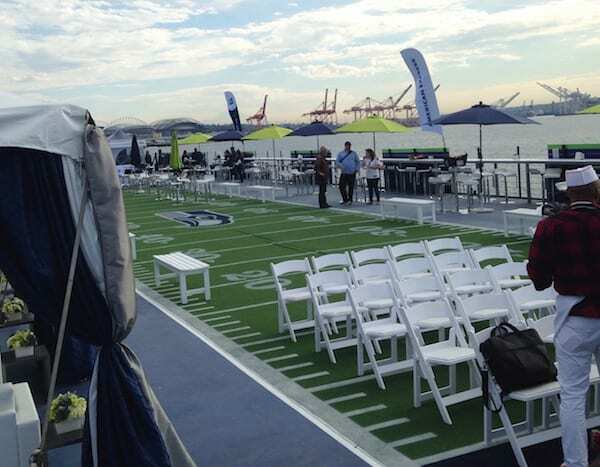 American Express Hawks Island – taking the pregame experience to the next level. A first-of-its-kind event on a barge in the Puget Sound on Sunday, October 18th. 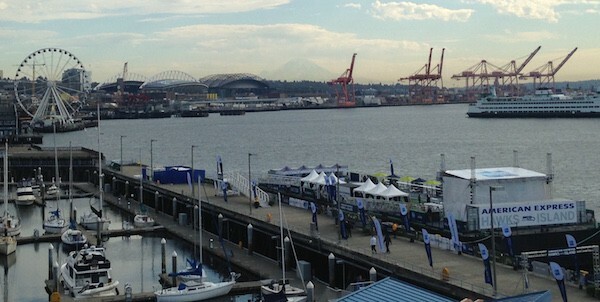 American Express Hawks Island will be the must-attend event before the Seahawks kick off week 6. Food and beverage from some of Seattle’s favorite eateries, a surprise live musical performance, a chance to meet Seahawks legend Shaun Alexander*, are just a few of the happenings planned for the day’s festivities. Also, complimentary shuttle service to CenturyLink Field will be provided. This exclusive event is complimentary to American Express® Card Members and up to one guest. Tickets available while supplies last. Must be 21 years of age or older to attend.